“A spacecraft destined to explore a unique asteroid will also test new communication hardware that uses lasers instead of radio waves. The Deep Space Optical Communications (DSOC) package aboard NASA’s Psyche mission utilizes photons — the fundamental particle of visible light — to transmit more data in a given amount of time. The DSOC goal is to increase spacecraft communications performance and efficiency by 10 to 100 times over conventional means, all without increasing the mission burden in mass, volume, power and/or spectrum. Tapping the advantages offered by laser communications is expected to revolutionize future space endeavors – a major objective of NASA’s Space Technology Mission Directorate (STMD). The DSOC project is developing key technologies that are being integrated into a deep space worthy Flight Laser Transceiver (FLT), high-tech work that will advance this mode of communications to Technology Readiness Level (TRL) 6. Reaching a TRL 6 level equates to having technology that is a fully functional prototype or representational model. “Things are shaping up reasonably and we have a considerable amount of test activity going on,” says Abhijit Biswas, DSOC Project Technologist in Flight Communications Systems at NASA’s Jet Propulsion Laboratory (JPL) in Pasadena, California. Delivery of DSOC for integration within the Psyche mission is expected in 2021 with the spacecraft launch to occur in the summer of 2022, he explains. “Think of the DSOC flight laser transceiver on board Psyche as a telescope,” Biswas notes, able to receive and transmit laser light in precisely timed photon bursts. The laser beacon to DSOC will be transmitted from JPL’s Table Mountain Facility located near the town of Wrightwood, California in the Angeles National Forest. DSOC’s beaming of data from space will be received at a large aperture ground telescope at Palomar Mountain Observatory in California. Biswas anticipates operating DSOC perhaps 60 days after launch, given checkout of the Psyche spacecraft post-liftoff. The test-runs of the laser equipment will occur over distances of 0.1 to 2.5 astronomical units (AU) on the outward-bound probe. One AU is approximately 150 million kilometers—or the distance between the Earth and sun. 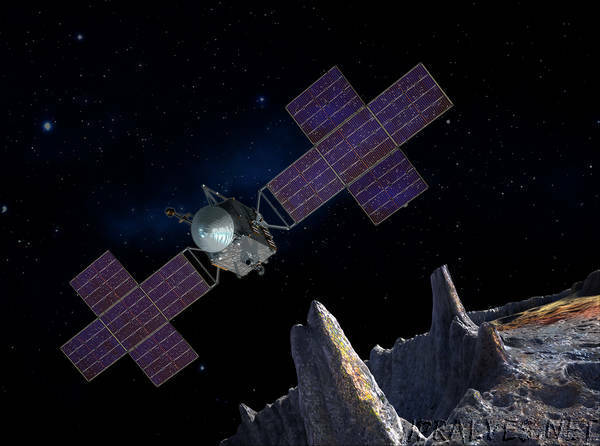 The Psyche mission was selected for flight in early 2017 under NASA’s Discovery Program, a series of lower-cost, highly focused robotic space missions that are exploring the solar system. The spacecraft will be launched in the summer of 2022 to 16 Psyche, a distinctive metal asteroid about three times farther away from the sun than is the Earth. The planned arrival of the probe at the main belt asteroid will take place in 2026. Elkins-Tanton adds that bringing robotic and human spaceflight closer together is critical for humankind’s space future. “Having our robotic mission test technology that we hope will help us eventually communicate with people in deep space is excellent integration of NASA missions and all of our goals,” she says. In designing a simple, high-heritage spacecraft to do the exciting exploration of the metal world Psyche, “I find both the solar electric propulsion and the Deep Space Optical Communications to feel futuristic in the extreme. I’m proud of NASA and of our technical community for making this possible,” Elkins-Tanton concludes.